Under the development name "X200", the mid-size S-Type was manufactured and marketed by Jaguar Cars from 1999 to 2008, and was envisioned as a revival of the 1963 S-Type. With a total production of just under 120,000 units it was not one of the best-selling Jaguars despite Jaguar's continual improvement efforts. While Jaguar ironed out the first year bugs quickly, the other manufacturers continually improved their models too. The rear wheel drive S-Type was based on Ford's DEW platform, which was also used in the Lincoln LS, Ford Thunderbird, and is being continued on the Jaguar XF model. While all of these cars shared the same basic body shell, the drivetrain and suspension were unique to the Jaguar line. Styling was a throwback to the popular 1963 X-Type, but updated for the modern consumer. The car was available with your choice of two V6 gas engines, three V8 engines (one supercharged), and a V6 diesel. Transmission options were five-speed automatic or five-speed manual, and a six speed manual or six speed automatic, depending on model year. The interior design of the S-type was similar to models built in the 60's, with rounded edges, a U-shaped center console and a small trunk, similar to the Lincoln LS but with classier styling. A sunroof and split/folding rear seats were available in some versions. Beginning in 2007, the successor to this car is the Jaguar XF (code name X250). 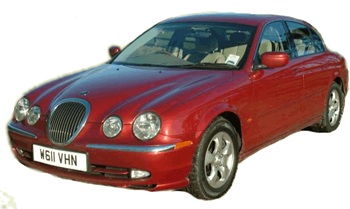 We have the most accurate Jaguar parts catalogs on the internet so that you are able to find the correct part for your car every time. Check out our complete line of new and used parts for the S-Type.